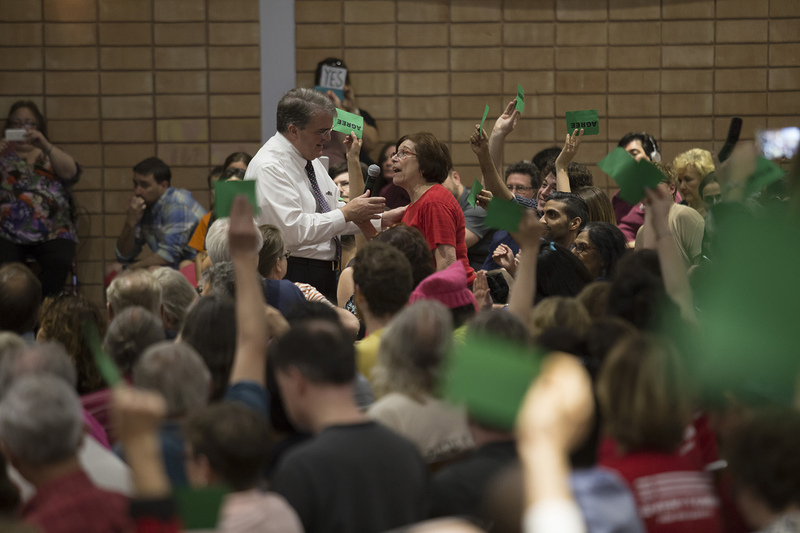 Before a rowdy town hall audience a day after House Republicans' efforts to repeal Obamacare collapsed, U.S. Rep. John Culberson, R-Houston, did not back away from the GOP's years-long push to scrap the law. HOUSTON — A day after House Republicans' efforts to repeal Obamacare collapsed, U.S. Rep. John Culberson, R-Houston, did not back away from the GOP's years-long push to scrap the law. 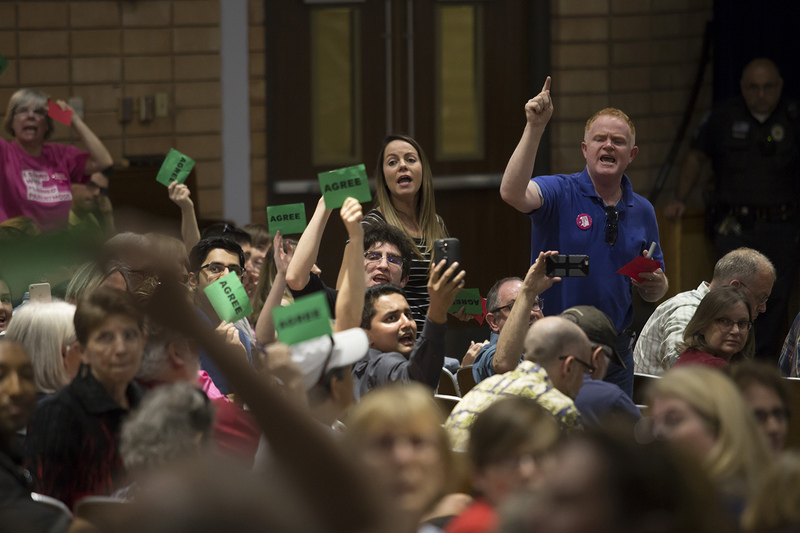 "The only way to fix it is to replace it," Culberson said before a rowdy town hall audience of several hundred people, some of them chanting "Fix it!" In an interview before the town hall, Culberson confirmed that he would have voted yes on the American Health Care Act, which House Speaker Paul Ryan pulled from the floor Friday when it became clear there was not enough support for it. Culberson said the legislation would have "repealed about 70 percent of Obamacare, and that's good enough for me." "We'll find a way because we have to," Culberson added, echoing President Donald Trump's claim that the law is "imploding." Under Trump, Republican lawmakers have faced increased pressure to hold town halls, especially amid the push to dismantle Obamacare. U.S. Rep. Pete Sessions, R-Dallas, experienced the scrutiny firsthand last weekend in Dallas, where he held a town hall that drew an openly hostile crowd. At Culberson's town hall, booing and shouting occasionally drowned out his responses, including when he was asked if he supports Trump's proposed cuts to the U.S. State Department budget. Culberson flatly said no as the crowd chanted, "Yes or no!" "I just answered," Culberson said, telling the crowd it could not hear him due to the chanting. "The answer is no. ... I'll work hard to protect the Department of State." Trump's proposed budget cuts were the topic of several questions. Culberson repeatedly emphasized the cuts are just a "recommendation" and expressed support for protecting the National Institutes of Health (NIH), the National Endowment for the Arts, federal grants for low-income college students and Meals on Wheels, the service that provides food to the elderly. He was particularly vocal in his opposition to Trump's proposed 20 percent cut to the NIH, saying he will do "everything in my power" to fight it. The audience largely voiced agreement as Culberson pushed back on parts of the president's spending plan. That changed, however, when the congressman addressed the sharp increases in military spending that Trump is pitching. "So you'd be for cutting the military?" Culberson asked the crowd, getting cheers in response. "I respectfully disagree. Our military has been badly defunded for years." Culberson also drew the ire of the crowd when he gave deferential answers on some of the most controversial aspects of Trump's presidency so far. Asked more than once whether Trump should release his tax returns, Culberson said he supports transparency by public officials but the decision is up to the president. Pressed on the need for a special prosecutor to investigate the Trump campaign's possible ties to Russia, Culberson pointed to a law that outlines the circumstances for such an appointment. Immigration also factored prominently into the town hall. In a lengthy back-and-forth with a questioner about deportations, Culberson insisted children who are in the country illegally "are not going to be bothered" as the Trump administration prioritizes the deportation of violent criminals. "You should not be concerned," Culberson told the questioner. "You should not be concerned in the least." The audience member pressed him further, alluding to reports across Texas that non-criminals have been swept up in raids purportedly targeting criminals. Culberson, a member of the Appropriations Committee, promised that Congress will use the "power of the purse and aggressive oversight" to ensure that immigration officials are "focused on felons and dangerous criminals." 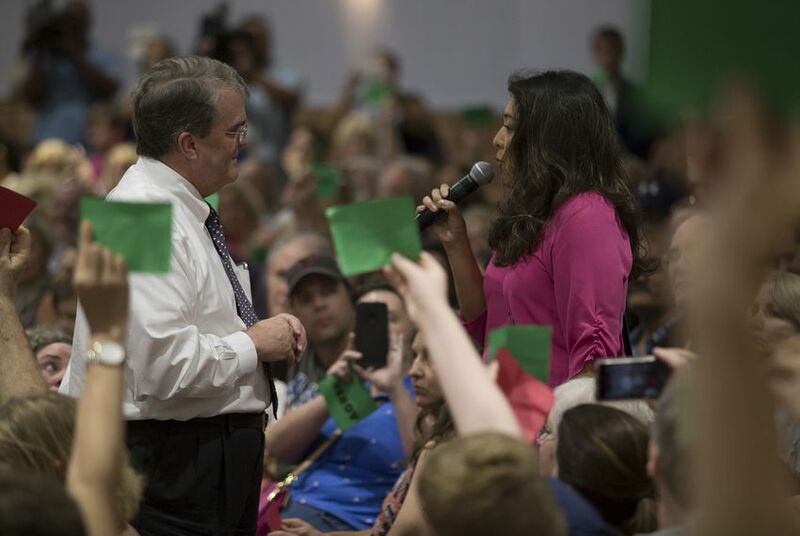 After the town hall, attendees said they largely disagreed with Culberson on the issues, but some gave him plaudits for holding the event in the first place. Culberson ended up taking 20-some questions over an hour and a half, allowing audience members to read their questions to him and often wading into the audience to meet them. "Begrudgingly I give him a B for sticking around and actually engaging with people," said Frank Ortiz, a 43-year-old graphic designer from Houston. "As far as content, I'd probably give him a D+/C-. I felt he held to a lot of the conservative Republican line on a lot of issues." Luke Herranen, a 29-year-old mechanical engineer, said he was pleasantly surprised by Culberson's comment about undocumented children — it seemed to go against GOP orthodoxy — as well as the congressman's clear opposition to some of Trump's proposed budget cuts. "I was like, 'Hey, that's great,' but we'll see how he votes," Herranen said of Culberson. "I have a feeling" the congressman won't follow through when it comes to voting, Herranen added. Culberson is one of two new targets in Texas — the other is Sessions — that Democrats have named for the 2018 election cycle. Democratic presidential nominee Hillary Clinton carried Culberson's district by 1.4 percentage points last year after the 2012 GOP nominee, Mitt Romney, won it by more than 21 points. Culberson acknowledged in the interview that the 2016 contest was a "highly unusual election, and Hillary Clinton won the district very narrowly." That will not change his strategy for 2018, he said. "Every election I always run as the one behind," Culberson said. "I never take any election for granted."